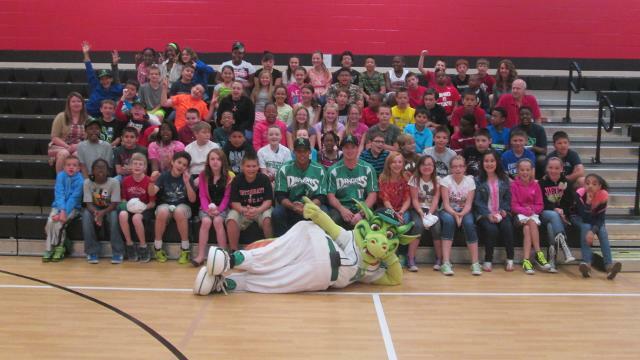 The Dayton Dragons today announced the expansion of their elementary school MVP Program into two additional counties, taking the program to more than 1,100 classrooms in 2015. A total of 274 classrooms in 34 schools in Miami and Warren counties have been added to the program, which already included 842 classrooms in Montgomery, Greene, and Clark counties. Click here for the Dayton Daily News story regarding the Dragons School MVP Program. In 2015, the program will include 1,116 fourth and fifth grade classrooms in 183 schools over 48 school districts. About 34,000 children will participate (up from 26,000 in 2014). The program will enter its 10th year in 2015. Due to the support of the participating sponsors, the program is completely free of charge to the schools. How does the Dragons School MVP Program work? The teacher in each of the 1,116 classrooms over the five-county area will select five MVP’s based on the teacher’s judgment of performance, effort, citizenship, and improvement. The five MVPs selected by their teacher in each classroom will get four tickets to a Dragons game, tickets to a special Field Day event at the stadium during the season, an MVP certificate and a Dragons MVP hat. Dragons players and mascots will visit selected classrooms over the course of the season. Additionally, MVPs are highlighted throughout the season. They record their own radio commercials that play during Dragons broadcasts. Their story is also featured in our PlayBall game program and in a 30-second commercial on Dayton’s CW. Twelve Dragons games during the season are designated as “MVP Game Nights.” On those nights, one MVP gets to throw out the ceremonial first pitch to the game, another does an on-air interview during the Dragons game broadcast on Fox Sports 980 AM, and another participates in an entertainment skit during the Dragons game. Two times each season, all classroom MVP’s are invited to attend the Dragons MVP Field Day at Fifth Third Field and interact with Dragons players. The Dragons MVP Program is also promoted via Facebook and Twitter, daytondragons.com, and in advertisements in the Dayton Daily News. The Dragons MVP Program presented by Bob Evans is also made possible by the generous support of Sinclair Community College, WDTN TV and Dayton’s CW Television. The Dragons open their 16th season in the Midwest League on April 9 at West Michigan and open the home season at Fifth Third Field on April 12 vs. South Bend. This article originally appeared on the official website of the Dayton Dragons . Click here to view the original story.